Georgia: Wisdom, justice, and moderation. I was watching and old "You Bet Your Life" with Groucho Marx from 1957 one time. They brought out an old man, and the contestants had to kind of play 20 Questions to basically figure out why he was there. It turned out that at the age of 97, the man was the only surviving witness to the Lincoln assassination, which I just found mind-boggling. Another time, they were interviewing a contestant, and during the little interview he said that he left his homeland in Latin America (I think it was El Salvador) because there was a revolution. Groucho kidded him that his family couldn't take a little revolution, to which the man responded, "Well, my dad was the President." Then one question came up that was interesting, and which I had never considered. Groucho asked, "Which is the largest state east of the Mississippi?" I was very unsure so I blurted out Pennsylvania. It turns out that with a land area of 57,919 miles, the largest state east of the Mississippi is Georgia, the 21st-largest state overall. Runners-up include, in descending order, Michigan, Illinois, Wisconsin, Florida, Alabama, North Carolina, New York, Mississippi, and then Pennsylvania. In several other states I have visited, including Kentucky and South Carolina, I had to skip the first welcome sign I saw because it was too dangerous to pull over. When I entered Georgia on US-319 from Florida, there was no sign. 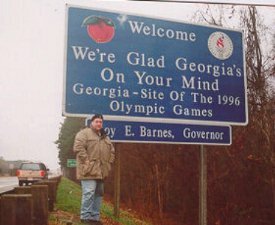 So when I left the Peach Tree State, I had to double-back and take this one since I just couldn't leave Georgia without taking this picture. So I pulled off of I-20. The shoulder was barely wide enough to contain my truck (which you can see off to the left there). On the other side of the guard rail the land took a pretty steep drop, and it took extra care to avoid slipping as it had rained the night before and was still misting over this morning. When I was all done, I had to wait quite a while for a gap in the traffic so I could pull back; the shoulder was just too narrow to achieve highway speed and then merge over. Normally this would be a sign I would bypass simply given the location. Ironically, this sign was on the opposite side of the same bridge as the South Carolina sign I skipped. "Georgia on My Mind" by Ray Charles is actually Georgia's official state song. They cleverly weaved that into the sign. And four and a half years later, they still are proud of hosting the 1996 Olympics. I have confessed to committing photographic hit-and-run in the states of Indiana, Kansas, and Missouri. In the beginning of the Project, I used to just take a picture in front of a state capitol without stopping to smell the roses, so to speak. It wasn't until my third big road trip (the first being New England, and the second covering Pennsylvania, Maryland, and Delaware) to Ohio, West Virginia, and Kentucky, where I took different pictures of the capitols and the grounds. 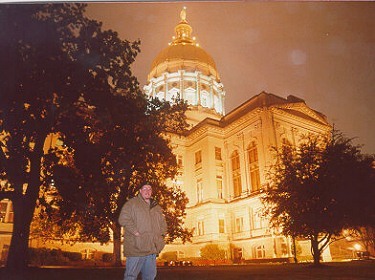 Atlanta was the first capital where I regressed on that. I spent maybe five or seven minutes here. But I think I had good reason. As I was driving up I-75, just past Macon, I started hearing an awful grinding noise in my truck. I pulled off and was able to get it to a garage. I told the mechanic about the noise, and he took it out for a test drive. "Man, you don't have to drive too far to hear that!" Over Labor Day weekend, my dad and I replaced the front left rotor which had more grooves than the Isley Brothers. We replaced the bearings after we used grease designed for C-130's (military transport aircraft) on them. It turned out that the grease and the bearings had an argument, and when the mechanic removed the rotor all of the individual bearings fell on the floor like they came out of a pi�ata. The garage didn't have its own parts, so the mechanic was cautioning that I might not have gotten out of there until the next day. So after he sent an assistant out to get new bearings, he radioed to the distributor that the rotor needed to be replaced as well. "Don't let my guy leave your store unless he has that rotor! This man has to be back in New York by 9:00 tonight!" So thanks to the fine folks at Lancaster Auto Service in McDonough, I was back on the road after about three hours or so. I was hoping to get to Atlanta around 3:00, but didn't make it until just after 6:00. It was about 35 degrees outside, and the drizzle and the wind made it feel that much colder. I got into Atlanta at the heart of rush hour (it was on a Wednesday), and after missing the exit and doubling back on the surface streets in the midst of traffic, I got to the capitol, which occupies a single city block. I parked in a 15-minute loading zone across the street in front of some kind of church-run day care center. Basically, my visit consisted of walking one time around the block, stopping long enough along the way to take a few pictures, but not long enough to actually see what it was I was photographing. That it was dark didn't help much either. Although my camera is a single-lens reflex and thus can make twilight look like noontime, the sodium lights illuminating the building are the only appreciable light source and make the off-white capitol building appear bright orange. I used both a flash and a long exposure in this picture. You can see water droplets on the lens. This picture was taken at a weird angle because one of the legs on my tripod broke earlier in the day in Florida. Unfortunately I didn't get to see Atlanta at all. I drove by Turner Field, but that was about it. Once I took my pictures, I got back in my truck and immediately left town, just to sit in traffic on I-20. I had also planned on stopping at the Kroger's supermarket in nearby Alpharetta, which is featured often in my favorite cooking show, Good Eats. With apologies to host Alton Brown, "But hey, that's another show." This page loaded in 2.668 milliseconds.